Spring is here and you’re loving the blooming tulips, the longer daylight hours and especially the warmer weather. Do you know who else is loving all this warm weather? Your friendly neighborhood burglar. During spring and summer months, burglaries increase as much as 200%. Police think that’s due to two factors: first, burglars don’t like to go out in the cold any more than the rest of us. And second, people love to leave their windows and doors open in the spring and summer. While burglaries in your neighborhood might increase during these next few months, there are a few things you can do to minimize your chances of a break in. He and others like him commit over 2 million burglaries every year. He’s between the ages of 17 and 25 and he’s not a pro. He’s typically stealing your stuff to support his drug habit. He is likely to use your front door to gain access. Back doors and windows, too. He breaks in by kicking in your door, or using a pry bar or screwdriver. He’s in and out in as little as 10 minutes. He’s not likely to get caught; police solve only about 13% of home burglaries. He usually breaks in between the hours of 10 am and 3 pm. If you (or your kids) walk in on him, your odds of assault are high. He’s likely to case your home before breaking in. Your young, drug addicted neighborhood burglar doesn’t want to try too hard. Unless you live in a multi-million dollar mansion, the pros aren’t coming to your house; they don’t want your laptop and Oxycontin prescription. Your guy is a bust-in-and-grab-stuff kind of guy; not a disarm-the alarm-system-and-tie-up-the-butler kind of guy. He doesn’t have the same skills as the guys in the action movies, and he knows it. So, burglar boy cases your neighborhood before he strikes so he can choose the low hanging fruit: houses with open windows, lots of shrubbery and secluded entry points. What he doesn’t like: dogs, alarm systems, entry points that are visible to the neighbors and passing cars. The easiest way to prevent a burglary is to make the burglar think that your house is just too much work to break into. Get a dog… or at least a sign with a dog on it. Burglars hate dogs. Not because they bite, but because they bark. Well, and sometimes they bite, too. Barking dogs annoy the neighbors, who look out their windows to see whose dogs are waking up their napping toddlers. And burglars don’t like nosy neighbors to be paying attention to your house while they’re busy going through your medicine cabinet. If you have a dog, you’re already less likely to be the victim of a burglary. 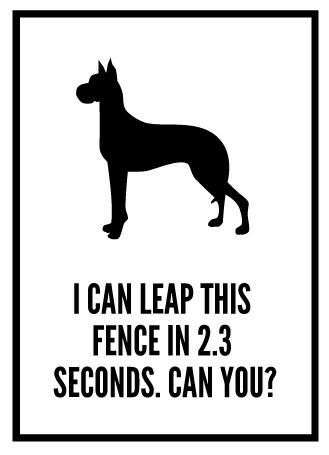 But adding a sign telling burglars that you have a dog is even better. And guess what? If you don’t have a dog, you can still make burglars think that you do. 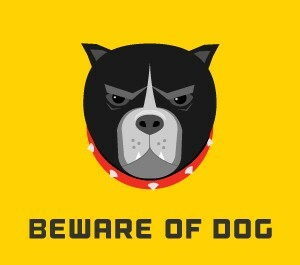 Most burglars are going to see your dog sign and not even think to question whether you really have a dog or not; they’re just going to move on down the street to find someone without a dog (or a sign). You don’t need a big dog. Get an alarm system… or at least an alarm system sign. Guess what else amateur, drug addicted burglars hate? Alarm systems. They’re so annoying and loud. If you have a system and your neighbors don’t, guess whose house is more likely to be targeted? The alarm companies don’t want to admit this, but the signs they give you are often more effective than the actual alarm system. After all, most burglars aren’t going to check to see if you really have an alarm—they’re going to assume that if you have a sign, you have an alarm. That’s not to say that an alarm system is bad; they certainly have many advantages. But if you don’t have the money for an alarm system, a sign is a less expensive option and often almost as effective. 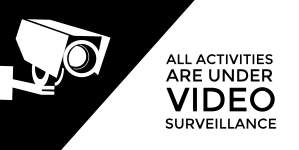 Get a surveillance camera… or at least a surveillance camera sign. For some reason, burglars tend to be camera-shy. They’ll pass up a house with a few cameras installed near doors and windows. You can actually buy a decent camera for less than $100, but if you don’t want to spend the time and money installing one, a sign can almost as effective. Trim bushes and trees, especially around doors and windows. Keep doors and windows locked. Install deadbolts and heavy-duty strike plates. Change the locks when you move into a new home or apartment. Organize a neighborhood watch—and advertise its existence everywhere. If you do fall victim to a burglary, you may be able to mitigate your losses by hiding or locking up the items your burglar is after. Prescription drugs. Particularly painkillers and ADHD medication; these can be quickly sold on high school and college campuses. Laptops, tablets, phones and iPods. The small, valuable electronics you have sitting around your house don’t require heavy lifting and they’re quick and easy to sell. Cash. Don’t leave it sitting out, or put it in obvious places, like your top dresser drawer or desk drawers. Credit cards, checks, social security cards, passports. You know that little built-in desk in your kitchen? It’s your burglar’s favorite spot to raid because it’s where you put all your important documents. They’re easy for you to access… and they’re easy for him to access, too. This is particularly bad because the trauma of your burglary won’t just end when he takes your stuff. Your financial and personal documents make it possible for him to steal your identity (or sell the stuff to someone else who will) and you can spend months trying to undo the damage. Guns. If they’re not under lock and key, they’re easily found under your bed or mattress or in your nightstand drawer. They’re not going to protect you from the burglar, because you usually aren’t even home when he breaks in. Even worse—your stolen gun is likely to be used during the commission of a crime, according to police.